Somehow Día de los Muertos, or Day of the Dead, confuses Americans. Often mistakenly thought of as “Mexican Halloween,” Día de los Muertos is actually a celebration of the deceased, a way to embrace rather than fear death. Originally an Aztec holiday dedicated to Mictlantecuhtli, the goddess of death, it was later smelted into with the Catholic celebrations of All Saints’ and All Souls’ Day after the Spanish came to the New World. Today many Latin American countries celebrate a pair of holidays: November 1, Día de los Inocentes, on which children who’ve died will return to their families; and November 2, Día de los Muertos, for departed adults. Leading up to their loved ones’ return, family and friends decorate intricate and ornate altars known as ofrendas in their honor, with photos, flowers -- often marigolds -- shots of mezcal, candles, and other personal items. Keepsakes, marigolds and hard liquor make this party less macabre and more emotional than Halloween. Slowly, too, cities in the United States are coming around to these unique traditions. North of the border, here are some of the best Día de los Muertos celebrations, sugar skulls not included. San Antonio is a major melting pot of Native American, Spanish, French, and German influences. But none surpasses the Latin American feel that vibrates throughout the city, especially in the La Villita Historic Arts Village, set right off the River Walk. The Day of the Dead celebration at La Villita is loud, full of energy, and totally infectious. 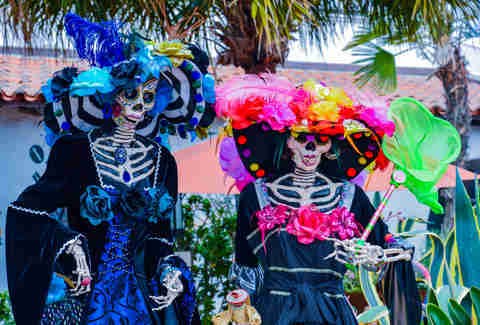 The highlight is a nightly procession in which a drummers dressed as skeletons bang out beats for dancers who perform traditional Aztec movements and puppeteers animating ornate skeleton puppets dressed to the nines. The smell of burning incense fills the air, and a beautiful fleet of stunning altars carried through the festival cast their glow. This year look for a new floating altar created by local artist Ana Fernandez that will float down the San Antonio river and honor the Chili Queens, who are believed to have invented Tex-Mex food. 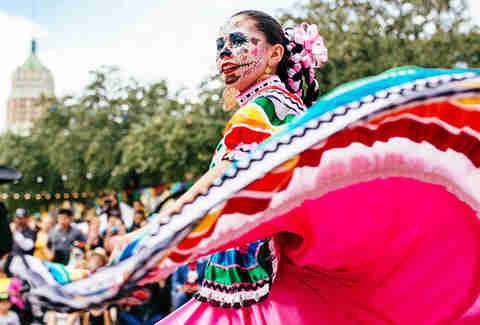 For more, scope our complete guide to celebrating Día de los Muertos in San Antonio. Considered the “birthplace of Los Angeles,” the historic, tree-lined Calle Olvera is a quaint Mexican market street plucked straight from a Disney movie. During the Olvera Street Día de los Muertos festivities, you’d think it fell right out of Mexico’s own celebrations at such places as La Golondrina Mexican Cafe and the many stalls selling tacos, fruit, and churros. Starting with nightly Novenario processions -- parades of the living dead -- people pay their respects in a colorful and vibrant march, carrying bowls of burning incense and huge photos of their loved ones. After each procession champurrado (hot chocolate-like drink made with corn flour) and pan dulce (sweet bread) are passed out to the crowd. Día de los Muertos on Olvera Street is also part of the Carrera de los Muertos, a 5K run that’s “rapido, divertido y pintoresco,” (fast, fun, and scenic). 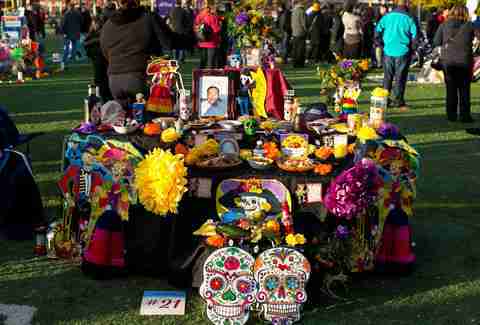 Runners paint their faces as sugar skulls and honor their loved ones at a runner's altar. You probably can’t get a more accurate and factual Día de los Muertos experience than at the Xicágo celebration held at the National Museum of Mexican Art because, well, it’s the National Museum of Mexican Art. As at most Day of the Dead celebrations, you’ll be able to get your face painted like a sugar skull and hear some incredible live music. But the museum also immerses guests in a full art experience. The Hollywood Forever Cemetery is the final resting place for some titans of the earliest days of show business and often regarded as one of the most interesting cemeteries in the world. 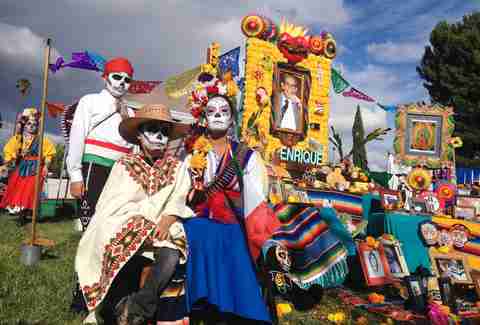 It’s the only cemetery in the country to hold an official Día de los Muertos celebration. Like most traditional Day of the Dead celebrations, this one starts with a traditional Aztec blessing, dancing, a procession throughout the cemetery, and live music from Grammy Award-winning artists before festival-goers explore some of LA’s most intricately crafted and personally adorned altars. 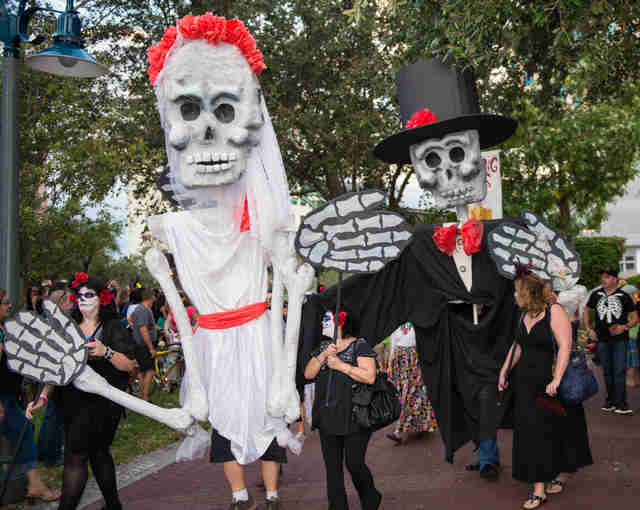 Normally staid Fort Lauderdale rocks a baller parade for the Florida Day of the Dead. The Skeleton Processional pays homage to the traditional cultural elements of the holiday while incorporating skeleton alligators, sea turtles, pirates, and mermaids. The parade, which begins at Huizenga Plaza, also has nice assortment of giant skeletons, too, making this parade literally over the top. To get the community involved, the festival offers workshops on traditional folklorico dance, giant puppet and mask making, and even how to make milagros, a sort of religious folk charm. You can’t get any closer to Mexico without actually being in Mexico. San Diego runs deep with Latin American influences, and a lively and unique Chicano culture that honors American and Mexican traditions. 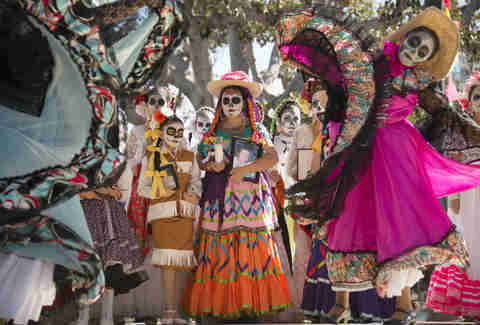 For Day of the Dead, the party turns up in San Diego’s Old Town, the purported “birthplace” of California and home to plenty of Spanish and Mexican landmarks. Student mariachi bands perform, Aztec dancers keep the crowd moving, and an afternoon parade highlights the community’s diversity. Along with the traditional costumes and outfits, this festival features a giant skeleton puppet and skeleton stilt walker to tower over the crowd. The festival also brings in a team of family history specialists to help guests look up their ancestry. 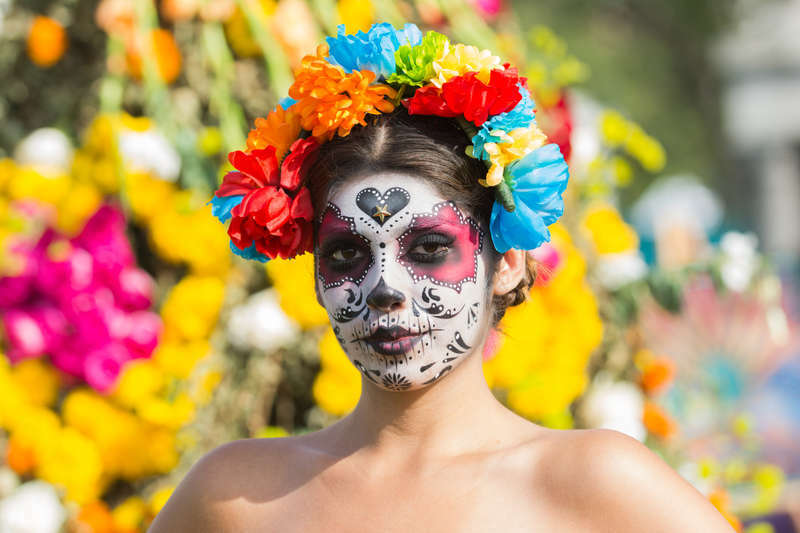 Tanner Saunders is writer at Thrillist who misses celebrating Día de los Muertos in Texas.